Stephen D'Ambrosio is a registered and certified Physician Assistant (PA-C) who earned his Bachelors of Science Degree (B.S.) in Physician Assistant Studies from D'Youville College in Buffalo, NY. He completed his Masters of Physician Assistant Studies (M.P.A.S.) at the Univeristy of Nebraska specializing in Internal Medicine. 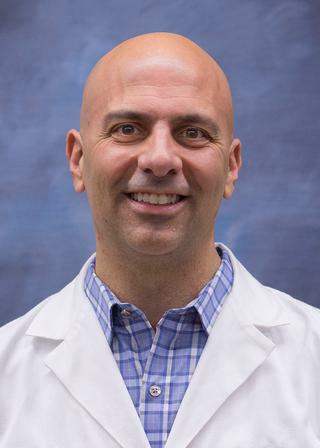 He is a native of Rochester, NY and has been with the University of Rochester Medical Center (URMC) since 1998. He has over 10 years of experience working in Internal Medicine at URMC. He has been a Faculty Associate in the Department of Imaging Sciences, Division of Diagnostic and Interventional Neuroradiology since 2009. Stephen's clinical work in Interventional Radiology includes performing and interpreting cervical, thoracic and lumbar myelograms, performing cervical and lumbar punctures, cisternograms, intrathecal chemotherapy, blood patches, intrathecal lumbar drains and bone marrow biopsies/aspirations. He also performs intrathecal spinal injections of Spinraza for Spinal Muscular Atrophy (SMA) patients. In addition, he has had training under Per-Lennart Westesson, M.D to perform pudendal nerve blocks. He is board certified by the National Commission on Certification of Physician Assistants (NCCPA). He is BLS and ACLS certified and credentialed to perform Moderate Sedation. Stephen has been a longstanding member of the Rochester Regional Physician Assistant Association (RRPAA). In 2016, he joined the RRPAA board as Membership Director. As of 2018, he is the President of the RRPAA. Aravindhan Veerapandiyan; Ria Pal; Stephen DAmbrosio; Iris Young; Katy Eichinger; Erin Collins; Per-Lennart Westesson; Jennifer Kwon; Emma Ciafaloni. "Cervical Puncture to Deliver Nusinersen in Patients with Spinal Muscular Atrophy and no Lumbar Access (P2.333)". American Academy of Neurology. 2018; .